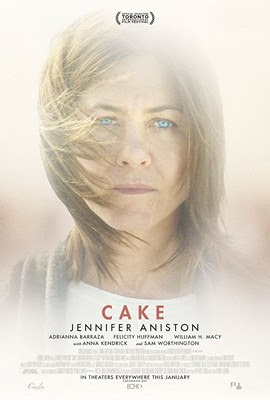 The Missus and I managed to sit down and watch a movie together for the first time in what felt like a long time and after some searching and discussion, the Missus mentioned that she had always wanted to watch the Jennifer Aniston flick, Cake so we found it on Netflix and gave it a go. The movie centers around Claire Bennett (Aniston) who, as the movie opens is struggling with chronic pain in the aftermath of a car accident that killed her son and imploded her marriage. When another woman, Nina (Kendrick) in her support group commits suicide, Claire develops a strange fixation on figuring out why she killed herself- since Nina had a husband and a son. Claire is unpleasant to her housekeeper, Silvana (Barraza), sleeps with the gardener, gets herself kicked out of her support group and drinks too much and takes way too many pain pills. So many, in fact that she starts to hallucinate Nina, who talks to her and advises her and after awhile, haunts her and forces her to confront her own pain. After attempting to bluff her way into Nina's house- only to be called on her lies by Nina's husband, Roy, who has been told about her- she strikes up a strange friendship with Roy and his son. This friendship seems to draw Claire further out of her shell, but when the man responsible for her accident (William H. Macy) shows up to attempt to apologize, it sends her into a downward spiral, which culminates with her laying on the railroad tracks at the drive-in where she first went on a date with her husband, contemplating death. She decides, however, that she was a good mother and gets up instead. She brings Roy and Casey a homemade birthday cake and a kite as an apology. She gets a picture of her son from her husband and then she hangs a set of wind chimes at her son's grave and then finally reaches a breakthrough of her own. Jennifer Aniston was nominated for a Golden Globe and a Critic's Choice Movie Award for this movie and by rights she should have scored an Oscar nod for it as well- if not won at least one of the big awards because she is absolutely fantastic in this movie. Not only does she prove beyond a doubt that she can do drama with the best of them, but the way she portrays Claire and her chronic pain is incredible. Every move, every gasp, every expression- everything right down to the subtlest of expressions lets you know that she is living with incredible amounts of pain. As a movie, I loved it. I thought Anna Kendrick would be in it more than she was, but I think it kept the movie nicely balanced at well. You could have made this into a dark comedy very very easily, but the focus is kept squarely on Claire and her journey and I think it's for the better, actually, because the journey the movie takes you on is one worth taking.